Having ridden to a fairly high level as a junior, I like many people, had a 15 year hiatus from cycling whilst work and family commitments took over. Conscious that I wasn’t really doing any significant exercise, I started riding again in 2008 as a bit of fun but was quickly bitten by the bug and wanted to get back into racing. I had always gone better on the track (albeit I really wanted to be a road rider) so that seemed a sensible place to start after getting a bit of fitness back and a couple of crits under my belt. The track was a slightly different scene than I remembered but the Masters racing was a huge bonus as it at least gave me a chance of being marginally competitive. After a couple of seasons I had had a bit of success with a couple of National Masters Champs medals but felt I had reached a level that I wasn’t progressing from. I knew Lee from old, riding as schoolboys on Preston Park so it was a pretty easy decision to sign up with him for some formal coaching. Up until this point I hadn’t been doing much more than ‘riding my bike’ but Lee immediately put in place a structured training plan based around a solid winter and then a season largely geared up towards the National and World Masters Track Champs. 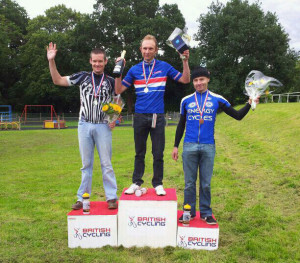 As soon as the season stated I knew I was riding better and ended up winning the National Masters Points race (my 1st national title) and getting a silver in the World Masters Points race later in the year. For the following season I took the decision to shelve the track and see how I faired on the road, so with a few amendments to the training plan we geared a season around the National Masters Road Race. Again, I had a good winter and as the season started was getting top 10’s in E/1/2 races which was pleasing as an over 40’s rider. Knowing I was in great shape I was looking forward to the national masters road championships, my main aim of the season. I am delighted to say I won, my second title in two years. Lee’s help has been invaluable over the past couple of years and I have no doubt I wouldn’t have had these results without his advice. I now feel I am training in a far more structured manner, not only in terms of a weekly plan but in terms of the specifics of each ride. The plan ‘format’ and interaction with Lee is also great as it makes you think about what you are doing, what works and what needs changing to meet any areas of weakness that need improving.